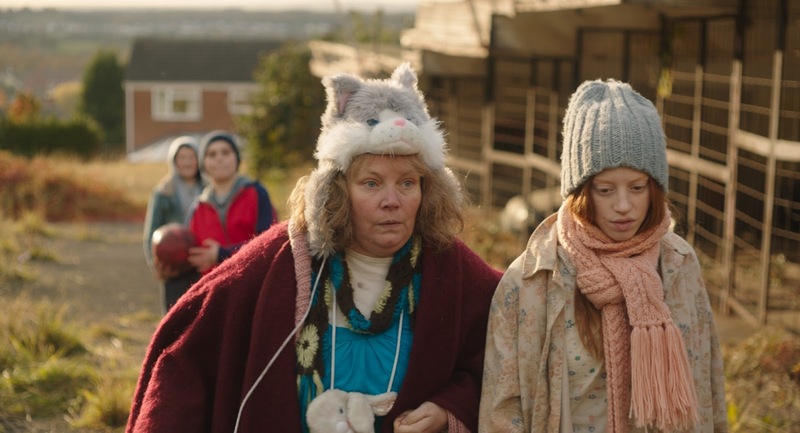 Pin Cushion (2017) is a British dramedy, written and directed by Deborah Haywood. It is the story of a complex mother and daughter relationship. The narrative of making a fresh start is juxtaposed against the complexity of the mother-daughter relationship, the inescapable cruelty of others, and Iona's budding adolescence, naiveté, and search for her identity outside the boundaries of the mother-daughter relationship which create the dramatic tension that moves the narrative. Stellar performances make the film. Joanna Scanlan plays Lyn, Iona's mother, and Lily Newmark plays her teenage daughter Iona. Scanlan delivers a poignant and nuanced performance of a downtrodden, marginalized, sympathetic and relatable character living with a physical disfigurement who is desperately trying to hold on to her teenage daughter who she adores. She brings a gravitas and dignity to her role and the luminosity of her humanity lights the screen. Lyn and Iona are likeable characters that will keep you rooting for them. Their closeness, tenderness and love for each other is deeply moving but under threat by Iona's budding adolescence and desire to separate and individuate. They have nicknames for each other. Iona calls her mother, Dafty One and Lyn calls her daughter, Dafty Two. They both share a love for cats and kittens and wear cat inspired fury clothing and accessories. The motif of cats and kittens runs throughout the narrative. It's a complex relationship. They share a bed, and it isn't until Iona begins to assert herself that she gets her own room. When Iona begins to spread her wings, she tunes out her mom and even publicly denies her which psychologically wounds Lyn. One of the most difficult scenes to watch in the film is seeing Lyn take a saw to her hunchback in the bath. One of the most powerful scenes in the film is when Lyn opens herself up and reveals her backstory at the friendship group at the local community centre. The adage to blame the victim rings out loud and clear. Linda's comments, one of the participants, to Lyn are cruel, "This is a friendship group not a freak show." Another powerful scene is when she demands her step ladders back from her neighbor. One of the sweetest scenes is seeing mother and daughter doing a dance in the living room to a lovely piece of music. One of the funniest scenes is when Iona comes home and finds her mom lapping milk from a dish and making cat sounds. One of the most interesting and bizarre scenes in the film involves Lyn's attendance at a psychic show and the advice the psychic leaves Lyn. Some of the most difficult scenes to watch involve Iona spiraling out of control and self-destructing. It's a complex film showing the cruelty of others, and the self-harm we inflict on ourselves. Iona's attempt to fit in with her peer group at her new school takes a devastating toll on her self-esteem, and she doesn’t realize that she is putting at risk her close relationship with her mom in trying to fit in. 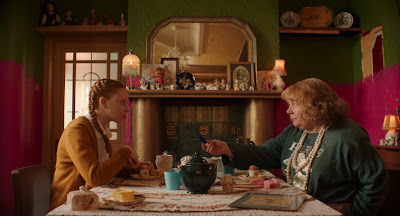 Pin Cushion can be seen as a coming of age film since Iona experiences many firsts such as sexual awakening, and making decisions for herself albeit the wrong ones. A good film is not without its villains and the film has several in the likes of Keeley, Stacie and to a lesser extent Chelsea. Sacha Cordy-Nice plays Keeley, the school bully, and does such a fantastic job of it that her performance leaves you speechless. She is the proverbial wolf in sheep’s clothing. Saskia Paige Martin plays Stacie and Bethany Antonia plays Chelsea. The cruelty Keeley inflicts on a naive Iona knows no boundaries and fuels the dramatic tension in the film. Keeley is one nasty girl, and Iona is a naïve, sweet girl who desperately wants to fit in, mistaking Keeley’s intentions. The cosmic dance the two dance together gets played out in the film to devastating consequences. Pin Cushion shines a light on bullying in the school system, and the myriad forms it takes from psychological and emotional abuse to physical isolation and intimation to cyberbullying. According to Maslow's hierarchy of needs, once our physiological and safety needs are met, we desire love and belonging including friendship and a sense of connection. The film contextualizes Iona's desire for friendship and belonging outside the confines of the mother-daughter relationship. We can sympathize and relate to her desire, and her acting inappropriately because she feels it is necessary to fit in even if her behavior is detrimental to her well-being. The director has woven together many visual elements to create a powerful film where new beginnings meet misery, disappointment, and tragedy. Close ups and medium angle shots are interspersed with wide angle shots and the film incorporates both day and night and interior and exterior footage. Haywood juxtaposes the real and the fantasied thoughts of Iona to express Iona's unconscious desires and fears which gives the film a complexity and richness. Haywood uses colored lens filters to saturate scenes with color and reference meaning, uses out of focus superimposed dissolving images to create a visual metaphor for sexual organism, frames certain scenes within the context of a hallway mirror to create backstory, and voice-over to express lies. Pin Cushion is a compelling and powerful film that will not only tug at your heartstrings but break your heart. Upon reflection, the film resonated with me on many levels such as the importance of mental health, relationships, redemption and second chances. It shines a light on parental relationships in particular the special bond between a mother and child. Mothers we have or have had but no one has the same kind of mother and so, our mothers have/hold different meanings for us. Yet, what mothers have in common, I believe, is the love they profess for their children, to protect them from harm, and their desire to be loved in return, and remain an integral part of their children's lives. The film dramatizes a special mother-daughter relationship between an eccentric loving mother living with a physical disfigurement and her sweet naive teenage daughter trying to spread her wings and forge a life outside the boundaries of the mother-daughter relationship, and the devastating consequences when the bond is broken. The film is well-made with superb acting and dialogue, and worth the price of admission. It’s just not an excellent film but has tremendous educational value and sheds a light on the devastating effects of school bullying and can serve as a primer for anyone who wants to understand the ugliness of this unacceptable social phenomenon.